In February, Charis learned about the solar system. As we've been going over the different planets, I remembered the Pluto is no longer considered a planet (and heard various explanations from people-most of whom were slightly sarcastic or indignant. Because of their bias, I was never satisfied with there answers). 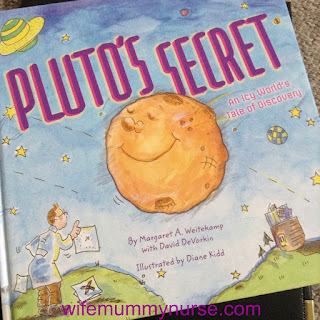 Pluto's Secret helped me better understand the uncertainty as to why Pluto is no longer a planet. Charis memorized the planets: Mercury, Venus, Earth, Mars, Jupiter, Saturn, Uranus, and Neptune. In order to help her memorize the planets better, I told my daughter, "When mama was a little girl, she learned that Pluto was a planet! But is Pluto a planet? No, here's why..." Then we read Pluto's Secret.